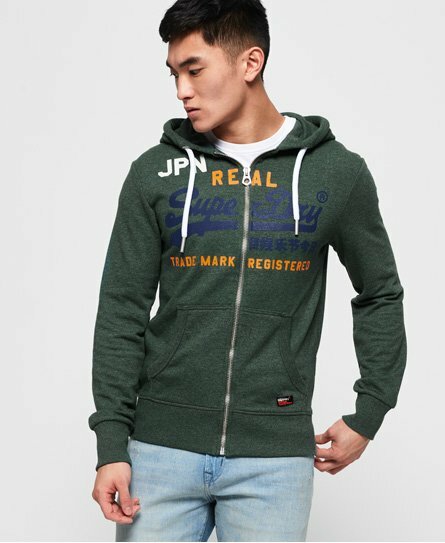 Superdry men’s Vintage logo split lite zip hoodie. This lightweight zip hoodie is the perfect trans-seasonal piece to layer when the weather is milder. It features a single zip fastening, a drawstring hood and two handy pockets. In addition, this hoodie has been decorated with a multi-texture logo with cracked affect detailing, as well as ribbed trims throughout. To complete, this hoodie has been finished with a Superdry patch on the pocket and the signature Superdry orange stitch in the side seam. For a key look this season, partner this hoodie with your favourite tee, jeans and trainers for a timeless outfit.